If there is one game-changing advancement that can change the current realities of education and the future of how children learn, it is data. Schools are overflowing with data – attendance records, achievement data, even logs from mobile devices – and the questions remain: How can schools turn the data into actionable information? How can education systems create a culture that uses data to make decisions? How can the data be leveraged to make education better for today’s students, and generations to come? 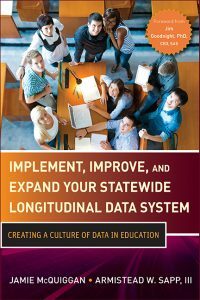 My new book Implement, Improve and Expand your Statewide Longitudinal Data System: Creating a Culture of Data in Education, coauthored with Armistead Sapp, aims to address these pressing questions. What’s a statewide longitudinal data system? Statewide longitudinal data systems (SLDSs) are growing in popularity and prevalence. 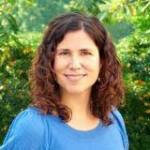 Many states (including North Carolina) have been the recipients of federal grant money to establish and enhance their SLDSs, toward the goal of having their data linked and accessible. SLDSs aim to connect data from educational entities, large systems that track student data from preschool through college and workforce across the state. Primarily, SLDSs prevent data siloes from existing, promoting sharing data with entitled stakeholders to enable smarter educational decisions. All of this sharing is within student privacy laws and FERPA, and indeed, a strong SLDS can enable better compliance to these laws. Longitudinal data are repeated measures of the same information over time. It could be attendance records, test scores, discipline data – anything measured and stored. Having more data in one place enables a more complete picture of each student. Well, that’s great, but don’t we have that? What can an SLDS do that other data systems can’t? SLDSs offer substantial improvements over previous data systems, ones that promise to change the way education is conducted for the better. Data driven decisions, maximization of resources and improved student outcomes all begin with investment in a culture of data from the leadership level to the teachers in the classroom. With longitudinal data, leaders can see patterns and trends: are reading scores improving overall at a certain school? District wide? With enough data, it might even allow leaders to figure out why the scores are changing. The breadth of data contained in an SLDS further allows for teachers to have better data available to them, and make decisions based on what was successful for other students with similar circumstances. Tools like early warning systems can be enabled with longitudinal data to predict something like the likelihood a child will drop out of high school as early as elementary school. It offers an opportunity to create a true permanent record for each student, rich with much more information than past systems. An SLDS is a resource for the state. There’s no disagreement that schools are managing more than they ever have before, and at much higher stakes. We are demanding higher test scores, improvements in graduation rates and literacy, and more effective teachers and often cutting resources available. It’s easy to see how efficient use of data could fall through the cracks. However, the missing link is that data can make educational systems and decisions more effective and easier, leading to better use of resources. Indeed, for all of the data currently in schools, it remains the most underutilized tool in the toolbox for the education system. With high levels of investment from state and federal government in SLDSs, it’s vital for educators and administrators embrace a culture of data. Read more about the innovative new book Implement, Improve and Expand Your Statewide Longitudinal Data System: Creating a Culture of Data in Education. The Texas Education Agency just made our Information Delivery Portal available to the public. The first set of reports are from the Texas P-16 Public Education Information Resource (TPEIR), a repository of longitudinal education data from prekindergarten through college for Texas public school students.